Israel’s Supreme Court has disqualified the leader of the far-right Jewish Power party, Michael Ben-Ari, from next month’s elections. Mr Ben-Ari has faced criticism over his comments about Israeli Arabs. 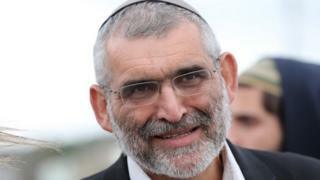 Attorney General Avichai Mandelblit has said they amount to “incitement to racism”. The court also reinstated Israeli Arab parties previously banned from contesting the 9 April poll. They had been barred from standing for their critical remarks about the state of Israel and the Israel Defense Forces. Ahead of the elections, Prime Minister Benjamin Netanyahu had forged an alliance with several far-right parties to try to shore up support. His right-wing Likud party is seen as a strong contender despite an investigation into corruption allegations against him. All governments in Israel are coalitions because the country’s system of proportional representation makes it unlikely for single parties to be able to govern alone. The court backed an appeal from left-wing politicians who argued that Mr Ben-Ari had made racist remarks. Mr Ben-Ari has claimed that he was referring to Hamas leadership – not all Arabs. And responding to Sunday’s court ruling, he said: “There is a judicial junta here which wants to take over our lives. The court’s decision marks the first time that a single candidate – not an entire party – has been banned from running in elections since electoral law changes were adopted in 2002.